Black Holes –Do They Function as Engines of Star Birth? The centers of most –if not all– galaxies host a black hole, some with masses of thousands of millions of Suns and consequently strong gravitational pulls that disrupt material around them. They had been thought to hinder the birth of stars, but now an international team of astronomers studying the nearby galaxy Centaurus A has found quite the opposite: a black hole that seems to be helping stars to form. Black holes at the center of galaxies 'switch on' from time to time, driving material around them into outflows that can stretch for millions of light years. The flows plough through galactic gas, compressing, heating and pushing it out of the way. Much of this gas is the raw material from which stars are made, so the outflows significantly affect star formation in the galaxies that host them. The astronomers used the Hubble Space Telescope's Wide Field Camera 3 (WFC3) to study the central regions of Centaurus A, catalogued as NGC 5128, a bright galaxy 13 million light years away in the direction of the southern constellation of Centaurus. In visible light, a prominent belt of dust can be seen running across the galaxy and when observed at X-ray and radio wavelengths it has jets extending for up to a million light years from a central black hole. With WFC3, the scientists took a close look at the 'inner filament', a region located close to the outflow that is a source of ultraviolet and X-ray emission, as well as being bright in visible light. Using the Hubble images, the team were then able to map out the star formation history of the filament with unprecedented accuracy. They found that the tip of the filament closest to the outflow contains young stars, the ages of which are similar to the time since the outflow 'switched on' but that there are no young stars further up the filament. This is exactly what is expected from an outflow overrunning a cloud of gas sitting in its path. The densest central parts of the cloud are compressed and collapse to form stars, while the gas on the outskirts is swept away from the tip of the filament, like a pile of autumn leaves in the wind. 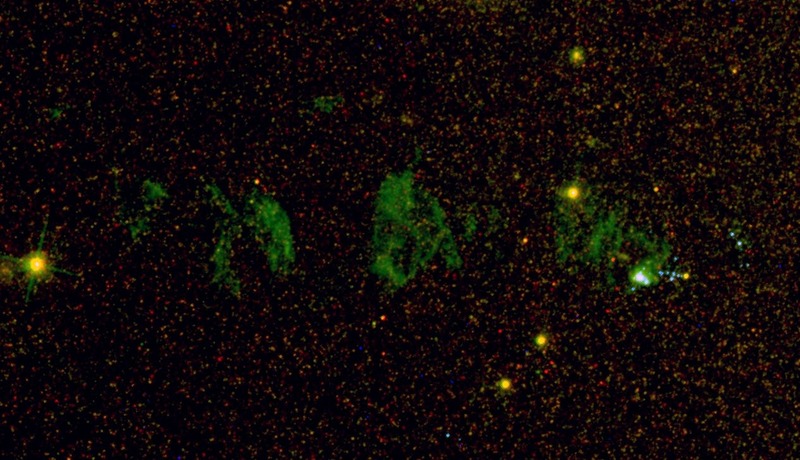 "This enhancement of star formation by outflows would have been even more important in a younger universe, where dense clumps of gas were much more common," said Stanislav Shabala of the University of Tasmania. "Our study highlights the need to consider the role of 'positive' feedback from outflows in our current paradigm of galaxy formation. It adds an exciting new piece to a great puzzle – that of understanding how galaxies came to be the way they are today." Image at top of the page shows the 'inner filament' of the galaxy Centaurus A. The filament of ionized gas, seen here in green, begins near the newly formed stars on the right of the image, depicted here as blue-white dots. The unseen black hole is to the right of the image. The left to right distance across the image is three thousand light years. The team, led by Dr.Shabala, Dr. Mark Crockett of the University of Oxford, and Dr. Sugata Kaviraj of Imperial College, London, publish their results in the journal Monthly Notices of the Royal Astronomical Society.